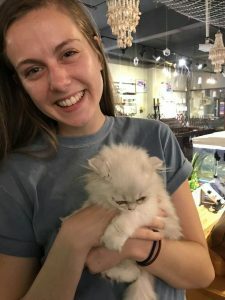 Here I am in a "Cat Cafe," a coffee shop that has lots of cats inside and is a nice place to go and study or just hang out with cats. These cafes are common all across Asia! I perched on my bottom bunk, freshly clean after a hot day of teaching and giving exams. I was alone in my dorm room, so I took the opportunity to place notes to each of my five roommates on their beds. During the month I spent in Asia, I not only taught English to university students but roomed with five local girls. I knew I would miss these girls when I left, and I wanted to share the gospel with them more boldly before my time ran out. That week, I asked my church to pray for me to not waste my words during the final week that I had left in Asia. Still sitting crisscross applesauce on my sky blue comforter, I opened my bilingual Bible to read through Galatians. One of my roommates came in, plopping her belongings on the floor by her bunk. I took a second to pray, “Lord, if it is your will, please have her ask me a question about my bilingual Bible.” I didn’t actually expect much to come of it, but God faithfully showed me that He is able to answer prayer according to His own timing. My roommate found my note on her bed, and instead of a simple “Thank you,” she came over to chat with me about how her day and month had been going. As our conversation progressed, she motioned towards my Bible and asked, “Are you memorizing the Bible or just reading it?” I was surprised that she asked such a direct question about my Bible since most of the locals I knew didn’t even know the English word for “Bible.” Her question allowed me to share some passages with her, and ultimately to share the news that Jesus saves us by grace. There was no dramatic conversion, and she did not accept my invitation to attend a Bible study the next day. However, I saw an answer to my prayer and to the prayers of the church. God opened the door for a conversation about the Bible and allowed me to share the good news of His salvation. The conversation I had with my roommate is just one way that the Lord answered prayer over the five weeks I spent in Asia. The long term workers will water the seeds that were planted over the summer, but only God can make them grow. Please continue to pray for the work going on in Asia.